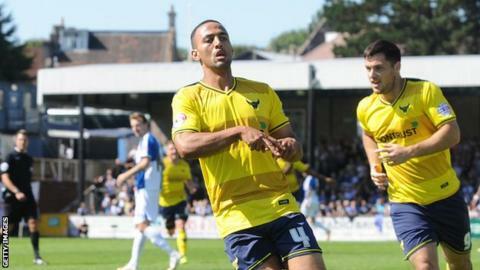 Oxford United midfielder Kemar Roofe hit a stunning winner to secure victory over Bristol Rovers in a game both sides finished with 10 men. Rovers midfielder Ollie Clarke received a straight red on 16 minutes after challenging Danny Rose for a header. The U's then had Liam Sercombe dismissed for a second bookable offence with just over half an hour remaining. Moments later Roofe collected a knock-down from Pat Hoban and curled into the top corner from just outside the box. The win lifts unbeaten Oxford up to fourth in League Two, three points behind early season pace-setters Leyton Orient. The visitors had to battle for the three points, even after referee James Linington adjudged Clarke had led with an elbow in an aerial challenge on Rose. The Pirates had several chances to draw level but U's keeper Sam Slocombe saved from Jermaine Easter, Tom Parkes and Chris Lines. Substitute Billy Bodin had a late claim for a penalty waved away following a challenge from Hoban in the area. Match ends, Bristol Rovers 0, Oxford United 1. Second Half ends, Bristol Rovers 0, Oxford United 1. Attempt missed. Tom Parkes (Bristol Rovers) header from the centre of the box is close, but misses to the right following a corner. Corner, Bristol Rovers. Conceded by George Baldock. Attempt missed. Cristian Montaño (Bristol Rovers) right footed shot from the right side of the box is too high. Substitution, Oxford United. Josh Ruffels replaces Danny Hylton. Corner, Bristol Rovers. Conceded by Pat Hoban. Corner, Bristol Rovers. Conceded by Sam Slocombe. Attempt saved. Chris Lines (Bristol Rovers) right footed shot from outside the box is saved in the top centre of the goal. Foul by Alexander MacDonald (Oxford United). Substitution, Bristol Rovers. Billy Bodin replaces James Clarke. Corner, Bristol Rovers. Conceded by Danny Rose. Attempt blocked. Tom Parkes (Bristol Rovers) right footed shot from outside the box is blocked. Attempt saved. Tom Parkes (Bristol Rovers) header from the centre of the box is saved in the top centre of the goal. Substitution, Oxford United. John Lundstram replaces Kemar Roofe because of an injury. Substitution, Bristol Rovers. Cristian Montaño replaces Lee Mansell. Attempt missed. Lee Brown (Bristol Rovers) header from a difficult angle on the left misses to the right. Attempt saved. Pat Hoban (Oxford United) header from the centre of the box is saved in the top centre of the goal. Corner, Oxford United. Conceded by Ellis Harrison. Attempt saved. Jermaine Easter (Bristol Rovers) right footed shot from the centre of the box is saved in the centre of the goal. Goal! Bristol Rovers 0, Oxford United 1. Kemar Roofe (Oxford United) right footed shot from outside the box to the top right corner. Assisted by Pat Hoban. Second yellow card to Liam Sercombe (Oxford United) for a bad foul.